I believe it takes a village to raise children. It also takes a whole community to care of our poor, our sick, our disabled, our elderly, even our able-bodied citizens. From serving at community dinners to attending community fundraisers to shoveling the neighbor's driveway, I love to help! I am happily married, polyamorous, and currently celibate by choice. I am not looking to change any of that. 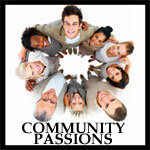 I would love to develop new friendships and spend some time in the community with you. Help us keep Community Passions free of spam and fake profiles.